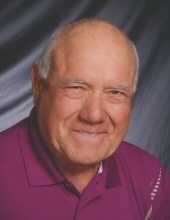 Celebrating the life of Louis H. McAbee Jr.
Obituary for Louis H. McAbee Jr.
Louis H. McAbee, Jr. (Buck) passed away peacefully on May 4, 2017 surrounded by his loving family at the age of 81 after a short illness. Lou will always be remembered for his dedication to family, his sense of humor, passion for community service and professionalism as an international airline captain. Lou is survived by his wife, Pauline (Parins), his children, Pam Mooney (Mike), Karen Cragg (Cliff), Dennis McAbee (Mary Jo) and Joy Gard (Eddie). Lou especially loved babies and enjoyed his six grandchildren, Ashley Nutter (Kerry), Kelly Preston (Brad), Ryan Cragg (Stephanie), Jordan Gibson (Trisha), Ross McAbee (Amanda Folta) and Danielle Gibson (Justin Rawlins) and six great-grandchildren, A.J., Lukas, Jack, Peyton, Julia, and Cruz. He is also survived by his brother, Ronald McAbee (Cheryl) and sisters, Nancy Kust, Dee-Dee Yanda (Dennis) and sister-in-law Julie McAbee as well as many nieces and nephews. He was preceded in death by his grandparents, Henry Louis and Sadie McAbee, parents, Louis and Adella McAbee, brothers, Norbert, Roger and Don and sister, Shan. Born on September 29, 1935 at home in the town of Lawrence, Wisconsin. At a young age, he went to live with his grandparents to help out on the farm. After graduating from West De Pere High School at the age of 16, he attended St. Norbert’s College as well as the University of Wisconsin (Madison). He met his sweetheart, Pauline, one summer at Camp Bird and they were married in 1954. Shortly thereafter, he enlisted in the Air Force and served in the Wisconsin National Guard as a fighter pilot. The military service and love of flying led him to a 32-year career with Delta Airlines residing in Richmond, Illinois. Retiring in 1995, he found time to enjoy baling hay and hunting, sunset cruises on Newton Lake, flying his Bonanza airplane and driving his RV across the country every winter. Service was a natural part of Lou’s character with contributions as Richmond School Board President, President of Friends of the Crivitz Airport (FOCA), and a member of Richmond Rotary, Knights of Columbus through St. Joseph’s Parish, American Legion and the Elks. He was active as an ALPA representative for Delta and gave freely of his time, inspiring other aviation enthusiasts through the Young Eagles. He will be remembered for his soft eyes and bright smile which led him to be part of a Delta commercial in the 1970’s. It was rare to hear him raising his voice except when cheering for the Packers. We are thankful for his full and happy life, his jokes and deep love for his family. Friends may call at RYAN FUNERAL HOME 305 N. Tenth Street De Pere from 5:00PM – 7:00PM Tuesday May 9, 2017. Visitation will continue on Wednesday at Our Lady of Lourdes Parish Family, corner of Suburban Drive and Lourdes Ave., De Pere after 9:00AM. The Mass of Christian Burial will be celebrated at 10:30AM with Fr. Benny Jacob O.Praem. officiating. Entombment will follow at the Allouez Catholic Mausoleum. Please go to www.ryanfh.com to send online condolences to the family. To send flowers or a remembrance gift to the family of Louis H. McAbee Jr., please visit our Tribute Store. "Email Address" would like to share the life celebration of Louis H. McAbee Jr.. Click on the "link" to go to share a favorite memory or leave a condolence message for the family.